– 20mm Tongue and Groove Floor in Sleeping Area. 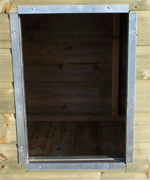 – Full Roof, made from 13mm Tongue and Groove and 44mm Framework. – 44mm x 44mm Framework. Smooth Finish with Rounded Corners. – 2 Galvanised Padbolts on Each Door, for Strength and Security. All chalets are 5ft 6″ to eaves.